Polish rabbi; died in Lublin in 1633. He was the son of Naphtali Hirsch of Moravia and a descendant of the tosafist Joseph Bekor Schor. 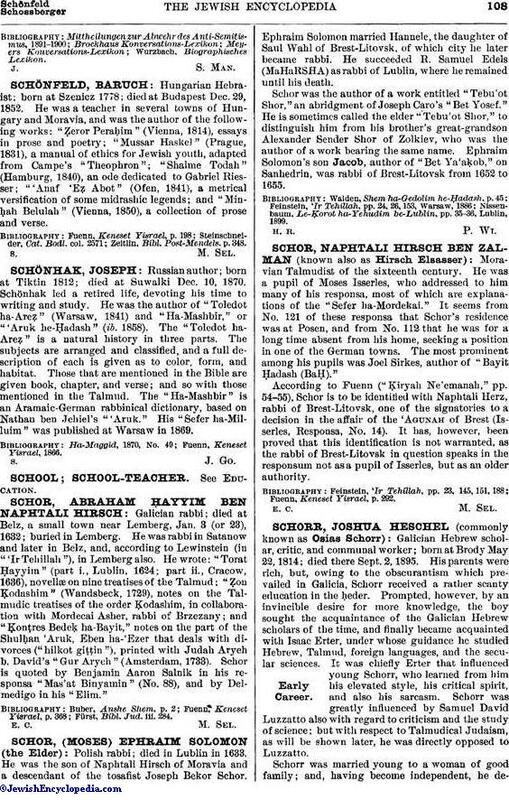 Ephraim Solomon married Hannele, the daughter of Saul Wahl of Brest-Litovsk, of which city he later became rabbi. He succeeded R. Samuel Edels (MaHaRSHA) as rabbi of Lublin, where he remained until his death. Schor was the author of a work entitled "Tebu'ot Shor," an abridgment of Joseph Caro's "Bet Yosef." He is sometimes called the elder "Tebu'ot Shor," to distinguish him from his brother's great-grandson Alexander Sender Shor of Zolkiev, who was the author of a work bearing the same name. Ephraim Solomon's son Jacob, author of "Bet Ya'aḳob," on Sanhedrin, was rabbi of Brest-Litovsk from 1652 to 1655. Nissenbaum, Le-Ḳorot ha-Yehudim be-Lublin, pp. 35-36, Lublin, 1899.